Until now, sharing 360 photos on microblogging site Tumblr had not been possible. 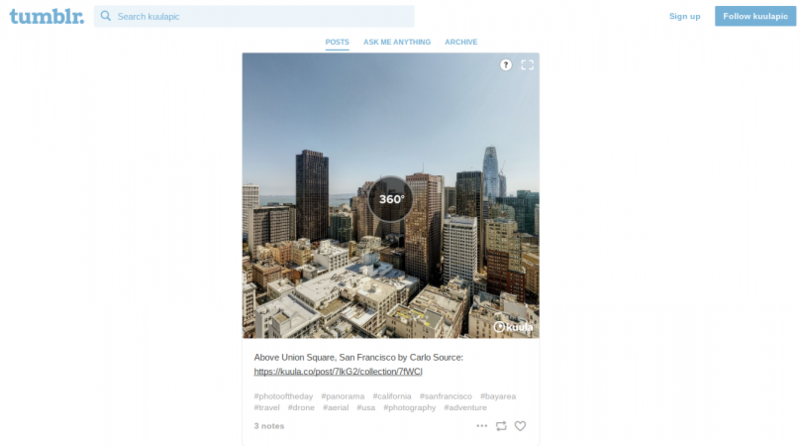 However, you can now share fully interactive 360 photos on Tumblr through Kuula. Kuula is a popular website for sharing 360 photos and artwork for free (though some features require a paid account). They recently added a feature to create an embed code that works with Tumblr. When the embed code is used on Tumblr, your post becomes a fully interactive 360 photo where you can look around, complete with a button to maximize the display, and it all happens transparently within Tumblr. Here is a sample from Kuula’s new Tumblr blog. 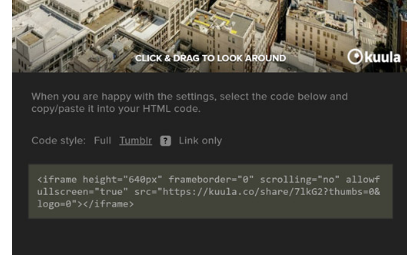 In Tumblr, you select “add video” (not add photo) and in the space for the html, you paste the embed code from Kuula. Here is a more detailed tutorial. I’m glad Kuula added this innovative feature. I hope the 360 photos that will be shared on Tumblr will increase awareness of 360 cameras and their possibilities among at least some of Tumblr’s 500 million monthly visitors! This new feature also gives you another way to share your 360 photos and reach a new audience. Here is Kuula’s official announcement for the new feature. Thank you very much to Tony Anastasi for bringing this to my attention! I am happy to say that I was the guy who nudged Kuula onto Tumblr. After I sent a message to them inquiring on the best embed method for Tumblr. Kuula support was quick to get back to me. And after a few days sent me an email stating that the Tumblr process was added to their embed editor. “Hi Bill! Here it is, just for you! Now you can share 360 from Kuula on Tumblr.” Of course it was not just for me but that was nice. Bill you da man!.. good work bro! Wow way to go Bill! You rock!! !